One feature that makes a skid steer loader, compact track loader, compact tractor or mini excavator such a popular piece of equipment is their ability to use a wide range of different attachments to handle all kinds of jobs. The standard attachment is a bucket - a basic scoop for picking up and hauling loose soil, gravel, mulch, etc. 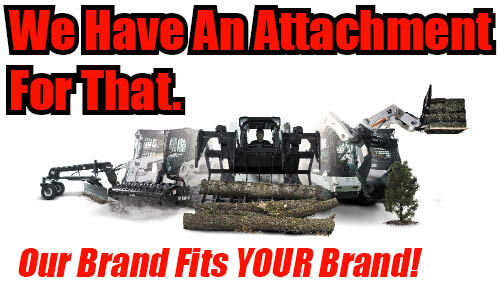 The varieties of attachments that Spartan Equipment offers go on and on – we offer over 100 different types. Fortunately, you don't have to make all your attachment decisions at once. It's very common for skid steer loader buyers to purchase the machine with one or two critical attachments, then return to buy additional attachments later. You can also rent attachments from most local rental establishments in your area, which is helpful when you need a specific tool only occasionally. Most major brand of skid steer loaders come standard with a pressure release coupler block. This means you'll secure and remove your attachment hydraulic hoses quickly with minimal effort. Different sizes and styles of buckets are used for different types of digging. Other common attachments include augers (for boring holes), root grapple (for pinching or gripping), hydraulic hammers and a vast assortment of others. (See Attachments) Most skid steer loaders now use the same "quick attach" couplers to secure the attachment to the front of the unit, allowing you to share attachments between most major brands such as Bobcat, Caterpillar, Case, New Holland, John Deere, Volvo, Kubota, Gehl, Mustang, Takeuchi and others. Attachments are almost all interchangeable among the different brands and models of skid steers, compact track loaders, thanks to a universal skid steer loader attachment bracket called the "quick attach." Even some compact tractors and compact wheel loaders use the same system, giving you the ability to share attachments among multiple machines and brands. The standard Bob-Tach™ mounting system helps you change attachments in less than a minute. Quickly replace a bucket with a pallet fork, landscape rake, auger, grapple and other attachments. Bobcat Company developed the exclusive system more than 35 years ago and it remains the industry standard. A very small number of attachments are not interchangeable, though. For example, a backhoe can generate so much torque that it could rip itself right off the quick attach without additional support. To avoid this, it gets attached directly to the frame of the loader, in addition to the quick attach. In these cases, the attachments won't work with brands other than the one they were designed for. Most powered attachments connect to the skid steer's hydraulics. However, a few high-powered attachments, such as cold planers and brush mulchers, require a high-flow hydraulic system. Not every skid steer loader has a high-flow hydraulic system, so be sure to review the power requirements of attachments you plan to use before you decide on a purchase. Why a skid steer, compact track loader, compact tractor, mini excavator, or telescopic tool carrier, utility work machine or utility vehicle with multiple attachment capabilities rather than a dedicated machine? Gives you the ability to adjust to changing markets, applications or multiple jobs. There are attachments for every season keeping you in business year round. Attachments offer a low initial investment with great return. It's easy to rent an attachment for a special job. In most applications compact equipment with attachments work as well or better than dedicated machines. Spartan Equipment is your one stop shop for all of you attachment needs. Spartan Equipment attachments are not an after thought – they are engineered to give you long life and reliability, with the best warranty backing in the industry. Spartan Equipment laser-guided attachments are integrated with your machine to provide precise working ability. Spartan Equipment attachments are setting the industry standard for attachment visibility and ease of entry/egress to machine with attachment installed. Spartan Equipment is one of the only major compact equipment manufacturer direct providers who gives our customers the best quality for the price. Spartan Equipment offers more attachments for more machines than anyone in North America.